“ I see the moon. The moon sees me. The moon sees the one I long to see,” I’d sung as a girl and later as a mother holding my young daughter. In the first days after my daughter died I felt her presence all over the house. But in a week, after I brought her life-sized portrait home and started talking to it, she seemed to fade away. Then something was drawing me out into the night, out to the driveway where the wind roared as it rocked tall trees over me. I’d never felt comfortable outside alone in the dark before. But there was little to fear next to the nightmare I’d already survived. 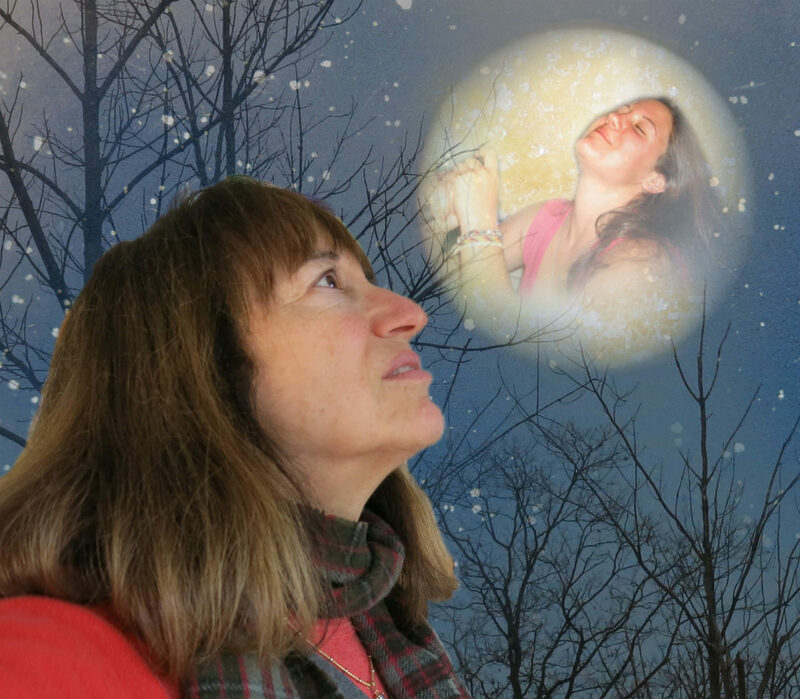 After my daughter died, nighttime became one of the gifts I got. And now, even in rain or snow, I bundle up in a down coat, grab the flashlight and my inherited dog, and walk up and down the long pebbly driveway, searching for stars, sometimes dancing with the dog in the moon-shadows. “Hey. Marika-in-the-moon,” I call to her when it’s a full moon. When it’s a fingernail moon. On moonless nights when the sky is a thick blanket of cloud. Every night. This is when I feel closest to my daughter. Our planet has one moon. I’ve been singing to it all my life. We can’t always see the moon but we know it is there. Our ancestors watched it and our children’s children will look up to the same night sky. And wherever my daughter is, or is not, if she were to look for light in the dark night, she would look to the moon. So I keep singing to the same moon. Where or when do you feel closest to the one you love who died? This entry was posted in 2014 and tagged communicating with the deceased, dancing in moonlight, I see the moon lullaby, singing to the moon, talking to dead loved ones on 2014/11/17 by Robin Botie. Fantastic photo, Robin. Thank you. I feel Vic in the forest, any forest, but especially the forest he loved. Today, all day, he was a longing in my heart. That’s where he always is. I think that’s good, Elaine. Better to have him a longing in your heart than to get attached to a particular forest. I wonder sometimes if I can move Marika from my driveway when I need to pack up and leave Ithaca for good someday. Yow Annette. Thanks. Can I spill my secret and still have you admire the photo? The stars background is really a shot of an old enamel paella pan, you know the white-spotted old fashioned blue-enameled metal pots? In the dining room light it had a neat glow to it like a night sky. Someday I will perfect my star-taking photography. Don’t know if it’s my limitation or my camera’s but the pan will have to work for now. Cheers! When I see the moon, when I look at the stars, when I hear a beautiful peace of music, when I wash dishes, when I brush my teeth, when I dream at night, when I eat a delicious meal. It’s been 42 years since he died and I’ve done countless hours of Eye Movement De-Sensitization and Reprocessing (EMDR) therapy and it has taken some of the sting out of the trauma of the loss, but I never stop missing him and visiting with him whenever I can. Hang in there, Robin. You are not alone! Hugs to you, Myra. That is one special man you’re keeping close in your heart. Cheers, sister.